- HANDCRAFTED ! 95% Ultra soft, premium rayon from bamboo and 5% Spandex exclusive of the Hydro-Shield underarm pads inner layer. Tagless lay-flat collar. Stay tucked in with added length. 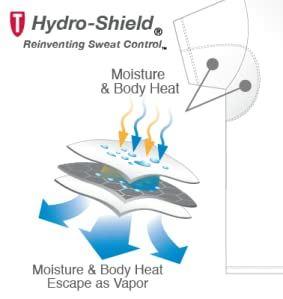 - FULLY INTEGRATED UNDERARM SWEAT PADS in every patented Women's sweat proof shirts, guaranteed to stop 100% of armpit sweat! The built in armpit sweat pads provide a sleek, consistent look & feel! Machine washer and dryer safe, the patented sweat guards are not chemically treated and will not lose effectiveness over time. - 100% RISK FREE! We accept returns or exchanges on all opened or used Women's sweat proof shirts for up to 30 days from purchase so feel free to wear it, wash it & try it! Confidence guaranteed! This Tee combines the best features of an undershirt with our proprietary underarm sweat proof technology to create anti sweat shirts for men and women that block excessive underarm sweat, providing complete protection from ‘wet marks’ and yellow stains! All woman and men's anti sweat shirts with Hydro-Shield Sweat Proof Technology comes with a Sweat Proof Assurance.